Nirmalya foundation is a group of companies situated at Bhubaneswar and Puri, Odisha to specialize in Agribusiness, Invest funds in plantations, Organic vegetable cultivation and horticulture business. 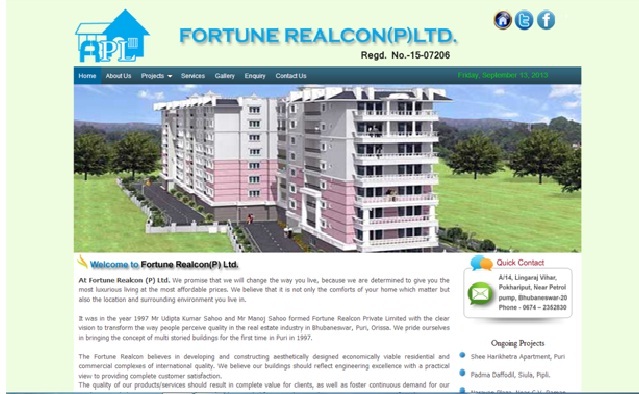 Fortune Realcon (P) Ltd under Nirmalya foundation promises to give you the most luxurious living at the most affordable prices. This company provides all the modern facilities within the project area like Temple, ATM, Market Complex, Community Hall, Children’s Park, Jogging Track and 24x7 Water supply.